Devon Decker is a student at Davis Technical College in Utah. He’s studying composite materials technology. Devon is first and foremost a student at Clearfield Job Corps, and a partnership between the Job Corps center and college makes it possible for Devon to advance in his new career. Wes Hobbs is Devon’s instructor at Davis Technical College. But there’s more than just Devon’s technical skills. He also learned valuable communications and other workplace skills at Job Corps that have given him the edge. 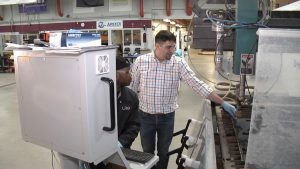 That’s right, global technologies company Lockheed Martin came knocking on Devon’s door after they toured Davis Technical College. Wes told Lockheed Martin Devon was a top student. So, Lockheed Martin flew Devon to Orlando, Florida for an interview. It was quite the experience for Devon. Especially, Devon says, for a young man facing serious challenges growing up in a rough neighborhood in East Denver, Colorado. Soon after the interview, Lockheed Martin offered him a full-time job with a $6,500 signing bonus. 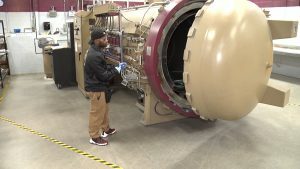 Lockheed Martin will pay for Devon’s continued education. Devon wants to an earn a degree in engineering, and Lockheed Martin will reimburse him for his college studies. Devon has left his mark on Davis Technical College. He was a finalist in the college’s student of the year competition. 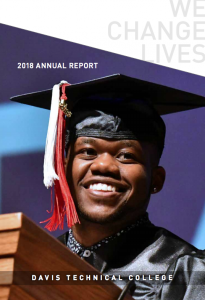 He also spoke at the college’s graduation and was even featured on their annual report. His college instructor credits much of his success to the Job Corps program.